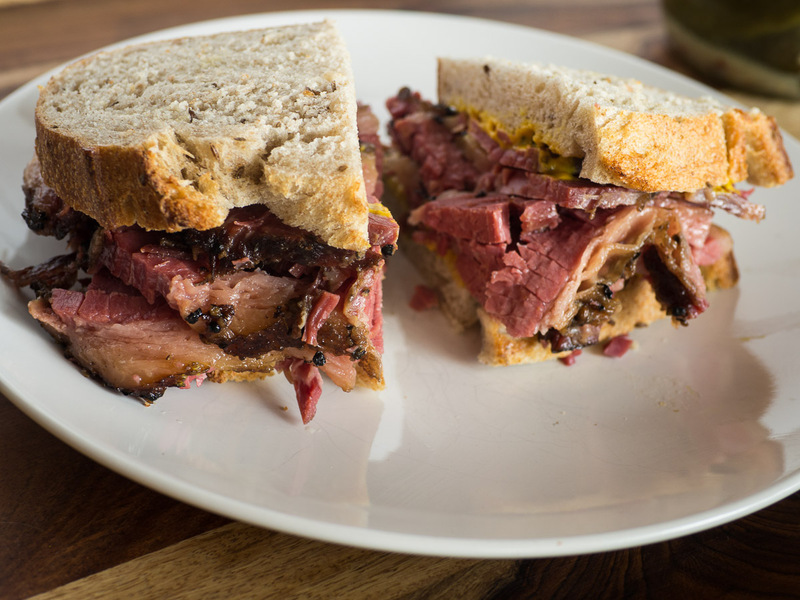 Montreal smoked meat is Canada’s answer to the pastrami sandwich. And it is a seriously great sandwich. I love sandwiches. And my absolute favourite sandwich is the Montreal smoked meat sandwich. Piled high on rye bread with ballpark yellow mustard and served up with a kosher dill. My second favourite thing to do with a brisket is to smoke it Texas style. BBQ brisket is one of the truly great things in this world. In my opinion anyway. But it’s hard to nail. Really hard. Overdone or underdone it’s dry. But there’s this point where BBQ brisket just jiggles when you poke it. Where it’s so juicy and flavourful. Magic. I’ve tried many times. Sometimes it fantastic. Sometimes it’s not. But I can make Montreal smoked meat consistently. And so can you. Making it is a campaign. Epic really. It takes 10 days start to finish. It takes up a bunch of room in your fridge. You have to tend to it every day. Smoke it then and then steam it. Real work. But it’s so worth it. And it’s pretty much bulletproof. Montreal smoked meat is cured, then smoked, then steamed. Just like pastrami. It’s made with beef brisket though. Pastrami is made with the navel. You want to find a source for a high quality, untrimmed brisket. If the fat cap is any less than 3/8 inch stay away. Fat is critical. You want it. This isn’t health food. No doubt about that. The first step is to cure the meat. So you need to know what you are doing. There are different formulas for curing salts. It’s important to understand the differences. This recipe uses pink salt or prague powder number 1. It’s 6.25% sodium nitrite in salt. If you use a different curing salt follow the instructions to make sure you are using the right amount. More is not better here. You want to use what you need and no more. These are nitrates. Those scary things everyone is always worried about. Pay attention. Maybe don’t eat this everyday. But once in a while probably won’t kill you. It’s a 8 day cure. Seems like a long time. But it works. Wrap it up. Make room in your fridge. And flip it every day. That’s it. Not hard. Just slow. The ultimate slow food. This is why it’s bullet proof. You aren’t trying to hit perfectly done in the smoker. Just trying to give it some good smoky flavour and a nice bark. Pull it after eight hours and put it back in the fridge. Don’t worry. You’ll finish it in a steamer. A big steamer. Montreal smoked meat is finished in a steamer. For 2 to 3 hours. This is where you get that wonderful jiggly texture. That perfectly juicy beef. Then it’s just a matter of letting it rest. Then all you need to do is slice it thin across the grain. And pile it high on good rye bread. A little ballpark mustard. Heaven. This is a true Canadian masterpiece. I think it's best sandwich in the world. Trim the brisket, removing pockets of hard fat and trim the fat cap (or just don't) to no less than 3/8 inch. Best to google this looking for "trim texas brisket". Combine all the cure ingredients and coat the brisket. You want to use all of it because you have included your curing salt in the mix and you need all of that. Wrap the brisket in plastic bags and place on a large cookie sheet. Refrigerate, turning the brisket over 2 times per day for 8 days. On the eighth day, soak the brisket in a sink of cool water for 30 minutes. Drain the water and refill, continuing to soak the brisket. Repeat this for 3 hours (6 water changes), dry the brisket and coat it with the pepper corn, coriander seed rub. Back into the fridge it goes. On the ninth day smoke the brisket for 8-9 hours at 225-250F with maple if you have it. You may need to separate the brisket into the flat and the point to fit it onto the smoker. After 8-9 hours remove the brisket from the smoker, let cool slightly and refrigerate overnight. On the tenth day, set up a steamer that will fit all this wonderful brisket. Outside is better. This is going to smell. Plan for this step. You are going to need a big steamer. I use a turkey fryer with an inverted strainer and about 3 inches of water to steam my smoked meat. Steam the brisket gently for around 3 hours. Don't let it boil dry. You are looking for a couple things. 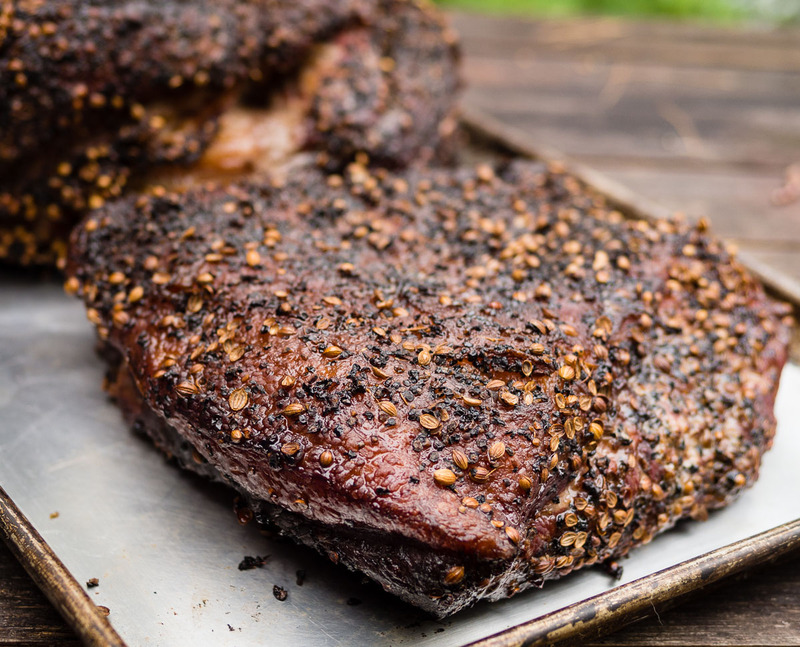 A 195-200F internal temperature will ensure tender Montreal smoked meat every time. Probe tender is the other key indicator. Take the opportunity to figure that out by getting a feel for it when you hit 195F. Probe tender means when you insert your probe you don't feel any resistance in the meat. It's like pushing a hot probe through warm butter. It just slides in. This is a good to learn if you are going to do briskets or pulled pork - it's how the pros figure out what's done and what's not. Once you hit 195F and probe tender pull the brisket and let it cool to around 160-170F. This can take up to an hour. Once it's cool enough to handle slice thinly against the grain with a sharp knife. Serve a mix of the flat and the point in each sandwich. 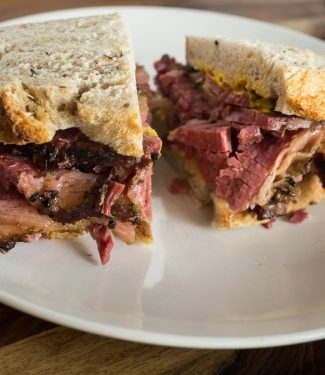 Pile it high on rye bread with yellow mustard and you'll have a sandwich worthy of any of the Montreal smoked meat shrines in Montreal. The prep time is about one hour but the cure takes 10 days so make sure you allow the time for the process to run its course. One easy way to crack the spices is to put them into a food processor and pulse until you get a coarse "grind". Fast and easy. What temperature do you cook to when you smoke on 9th day? I’ve added a target of somewhere around 155-165F for the smoke in the post. It’s not super critical if you are cooking a big packer (full brisket) as ultimately you want to get to around 195F during the steam step but be careful if you are trying this with a smaller brisket. Thanks for pointing this out. I can see where one might get confused. How certain are you of the brinning & rub make up relative to traditional recipes? As a displaced Montrealer now living in California I’m taking a shot at making my own. I’m most familiar with Montreal steak spice and its evolution from Schwartz’s and look to this blend as providing some guidance. What are you referencing for your brine and rub and how close to tradition do you think it is? Thx for detailing the process! I have eaten at Schwartz’s many, many times. I’m in Ottawa so it’s not far. Across the street at the Main as well (I like the latkes there). A buddy of mine who has lived his whole life within walking distances of Schwartz’s brought the rye bread in the picture from a bakery in Montreal. He says my smoked meat is as good or better than anything they are serving in Montreal today.